This beef noodle soup place opened at the start of January. For YongHe, this place is a pretty major pull. As per the standard pretty much around Taiwan – be expected to queue for good food. Bright and lively inside, I like the simple canteen approach. 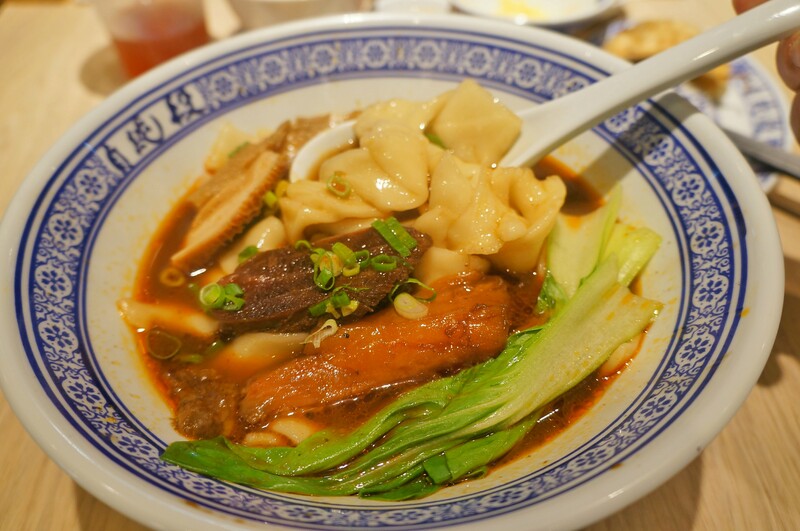 So this beef noodle soup is Sczechuan style, in that it is heavily spiced with deep flavours. Damn, those gyoza look gurrrd. To an unseasoned vet, this may look very unappealing. But, let me break it down for you and give you some ideas. Starting from Top left to bottom right – braised egg, seaweed, tofu, tofu skin, more tofu, radish, (bottom left, now), beef cheek, beef stomach, intestine, king oyster mushroom. Now, if you’re stomach isn’t strong enough to try the offal, I understand. But, I urge you to try. The stomach is delicious with a very unique texture, and a mild beef flavour. The intestine is chewy with a stronger flavour. The seaweed has a fresh, irony flavour, and all the tofu is good. They dip each of the ingredients you choose into the broth for a little while to reheat it, then wash the plate with all of the juices once more to really make sure the flavour is there. If you order one of the sets, then you can pick any of these sides to accompany your main. Maybe add one of these, if you’re in the mood for either something sweet to finish the meal off with, or with some delicious fried chicken. Spicy chilli oil – good to accompany the braised food plate, if (you should, really) are thinking of getting one. Mix this with the soy sauce below, and make sure to dip your gyoza fried dumplings in there. Winner, winner, delicious dumplings with dinner. Beware – this is spicy. But, beware – if you don’t put this in your beef soup, then you’re missing out. The best choice for the meals is to go for the set meals of either A, B, C, or D. Alternatively, go for the sharing meal underneath the selection available for D.
As you can see in the previous picture, it’s a bit of a grab-what-you-want kind of affair with the braised food. We opted for king oyster mushrooms, tofu, tofu skin, seaweed, and intestines. They were all very good, with perhaps the pic of the bunch being the king oyster mushrooms – somehow they just seemed to exude flavour with every chew. Just look at them. Mouthwater? Not particularly crammed full with filling, but these are so damn good with that soy and vinegar mix, that I feel it really is a must eat. The ‘手’ element of this dish specified in the menu is for these extra thick dreamy noodles. Flat, wide, chewy, tasty, brilliant. All words I used in perhaps my first sentence. The list is endless, though, truth be told. These noodles were really quite something. On the spoon you can see one of the tendons – not on the menu back in England, shame. So good! Silky smooth texture as you bite through pockets of tendon, with unctuous flavour. More, please! Three treasures beef noodles, with meat, stomach and tendon. Some beef stomach, some beef tendon, a (single) piece of beef, noodles, and some bok choi. The bowl looks busy, but most of it is noodles. Let’s talk about this broth: heavy, rich, spicy, deep, oily. I wasn’t finishing the whole bowl, that’s for sure. It was quite spicy to begin with, but the spice doesn’t linger for ages (a good thing, I feel). Overall, this is solid for YongHe. Some delicious beef, good broth, great sides, and nice atmosphere. But, I would probably opt for the standard beef noodle soup next time, and try the fried rice.